Story - 5: If patience is rewarded, then the current issue of Injustice 2 is the recompense for the slough of reading through so many issues with little or no satisfaction. Taylor successfully renders Supergirl's entry into Injustice, and applies succinct characterization for the supporting cast of Jor-El, Zor-El, and Alura. Krypton being, seemingly, destroyed by Brainiac isn't a new idea, but it fits well in the Injustice narrative of fighting and then more fighting. The only tweak that is needed in the plot would be Kara's reaction to Black Adam's retelling of Regime Superman's downfall. While the retelling is done with aplomb, for what villain doesn't see the world as Black Adam portrays it: "I'm right, the world is wrong, and we'd be better of if I was in control, but you lot betrayed me? "; Kara's reaction is too easy. She may come from Krypton, a futuristic world of super-science and technology, but the events of people coming from another dimension, and doppelgängers at that, should have given Kara some pause and need for reflection. Inter-dimensional travel isn't a norm on Krypton, even if they're fighting of sentient androids. Why can't Injustice be like this on a regular basis? The attraction of the series is its bare bones approach, its vs-battle logic, and its utter jettisoning of anything resembling continuity; there is obviously an audience that is ready and eager for the DC superheroes in a form that resembles anything but that. However, there is little building, very little construction of the world given by Taylor, which leaves the series in the regular conundrum of all serials: how much is retained, and what it relinquished? Continuity adds in major pay-offs for readers and for creators. It means that no character is truly wasted and that craftsmanship, attention to detail and the like must be performed lest the story implode. Continuity isn't a yoke, despite the modern writers resistance against it, and this tale shows that, as the story only rings true because it adheres to the events that have transpired. I never know what I'll get with an issue of Injustice, but at least, this time, it was high entertainment. Art - 4: The splashes this go around were excellent. Black backgrounds supporting vile scenes of lurid colors. Nice stuff. 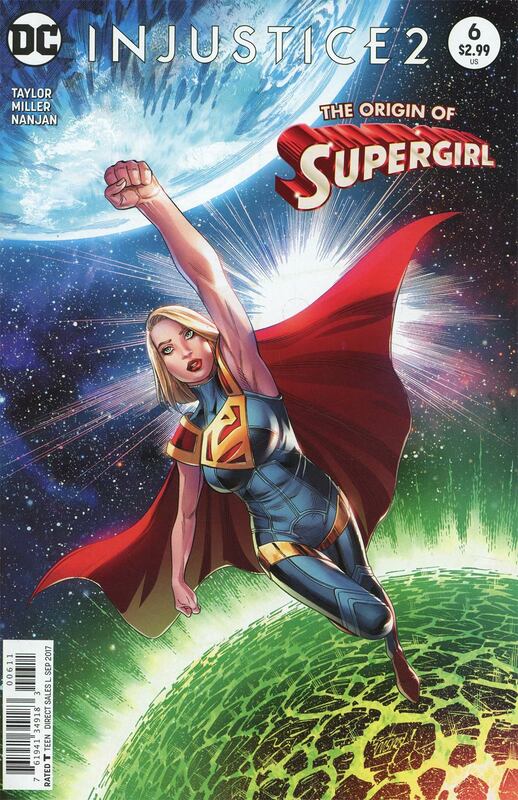 Cover Art - 5: Kara Zor-El is truly a galaxy girl.